A searing accusation cuts across two generations and right through a close-knit father-daughter relationship in “Heartland,” written by Gabriel Jason Dean and directed by Ari Laura Kreith, the powerful new play that opened at Luna Stage in West Orange on April 6. While the play, which runs through May 5, explores the lasting, and sometimes unpredictable, impact of propaganda, “The Diary of Anne Frank” makes an appearance as a plot element that underscores the universality of young women who exude optimism and hope while living (and dying) under a brutal regime. Getee (Lipica Shaw), a teacher in her late 20s, leaves her Omaha, Neb., home and her father, Harold (Brian Corrigan), to teach English to girls in her native Afghanistan. She hasn’t been back to her birth country since her parents were killed in a terrorist attack, and her adoptive father, an American professor, raised her in Nebraska. She goes back to learn her native language and culture, and figure out what else she needs to know about her identity. 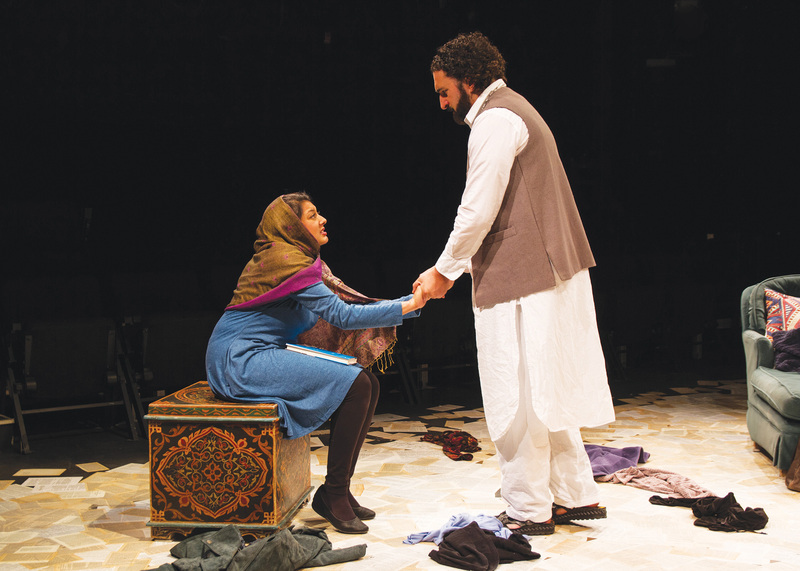 The play, set in 2013-2015, toggles back and forth between her classroom in the school in Afghanistan and the living room in her father’s Midwest home. There is no stage at Luna Stage; rather, the audience is seated bleacher style around the actors. The spare set includes a table, chalkboard and windows for the school, and a green velvet divan with side table/bench representing the Omaha living room. All three actors give formidable performances, especially Kareem Badr, who provides a deep authenticity to his role as Nazrullah, an Afghani math teacher. In Afghanistan, Getee teaches “The Diary of Anne Frank” to her students. It’s clear the selection is unconventional and rarely approved for teaching in the country, although a reason why is never provided. The audience is left to wonder whether Holocaust literature is not taught, or perhaps the intimate thoughts of an adolescent girl are considered inappropriate. Getee offers a copy to Nazrullah, who at first won’t take it because he worries the uncle he lives with will see the unsanctioned book. He expresses surprise that Getee is permitted to teach the work, while she expresses disgust that Nazrullah would allow bigotry to prevent him from reading it. He relents and as they discuss it, they begin to fall in love. What complicates the story and ties the three characters together is their respective relationships to a different book — an elementary school textbook from the days of the Mujahedeen in the 1970s. Nazrullah reveals that this kind of propaganda helped turn his friends and neighbors into Taliban recruits, which leads to the death of his beloved Getee (this plot point becomes known early in the show). Her father’s pivotal relationship to the textbook becomes clear later in the play. As a reporter for a Jewish newspaper, I found the use of “The Diary of Anne Frank” curious. It’s problematic when discussions of the Holocaust erase the particularity of the Jewishness that was so central to its evil core, and its literature becomes a kind of shorthand for universal principles. The lessons of the Holocaust should not be “Judenrein” — absent of Jews, yet “Heartland” erases Anne Frank’s Jewishness. Rather, she is an archetype, a stand-in for all young women who are full of hope, gunned down by terrorists and thugs full of hate, whose irrational political passions are inflamed by propaganda. She is Getee, she is Anne, and she is any of the young Afghani women in Getee’s class. That said, my philosophical point of contention should not keep you from seeing the play. With its heavy themes of love and war, guilt and propaganda, it’s a surprisingly moving and enjoyable play, ultimately about relationships — how they are made and how they can break. Highly recommended. Editor’s Note: This story was updated on April 18, 2019.